If you’re planning on extending your home with a high quality loft conversion, you should choose the superb Duratech DVX Ventilated Centre Pivot Pine Roof Window. Nothing transforms the interior of your property quite like added natural light. When carefully positioned, these roof windows allow in the maximum amount of light leading to rooms that feel brighter, airier and more spacious. These roof windows are available in a wide range of size options so you’re sure to find that one that best fits the size and shape of your loft conversion. Each of these windows features a toughened outer pane and is beautifully engineered ensuring a long and reliable lifetime of service. To find out more about these fantastic roof windows, keep reading below. The Duratech windows are a range of high quality centre hung wooden roof windows. These roof windows have a thinner frame and a very slim profile which gives them a more elegant interior design than competitor windows. The slim profile also allows for more daylight to your room ensuring that your rooms stay feeling bright and airy all day long. These windows have a high quality gas filled toughened thermo-pane with 4mm float glass, a 17mm gap with argon and 3mm float glass. These windows boast incredible energy performance with a U-value of 1.1 W / m2K. The disproportion of the glass (3mm and 4mm) also ensures that this particular type of pane has an excellent sound reduction. All of these windows are made from kiln-dried Nordic Pine with a fungicide protection through water-based vacuum impregnation. The wood has a knot-free appearance on visible surfaces and has been varnished with a clear water-based acrylic lacquer. To finish, these windows feature a high quality handle made from moulded zinc which allows for dual opening positions for passive ventilation. An issue that is all too common with roof windows is that they are insufficient when it comes to keeping out rain water. The Duratech DVX Ventilated Centre Pivot Pine Roof Window effectively eliminates this issue. Through the inclusion of an air vent on the top of this window, passive ventilation will occur even while your window is shut. This will ensure that your room stays nice and cool and prevent the unpleasant odour associated with stale air. The construction of the Duratech roof window ensures that you can obtain a great energy performance on your window. This means that you can easily keep the heat in and the cold out. When choosing the right roof windows for your property, you want to be certain that your home will be protected regardless of the weather outside. Duratech roof windows are suitable for all roofing materials when installed with the correct flashing kit. 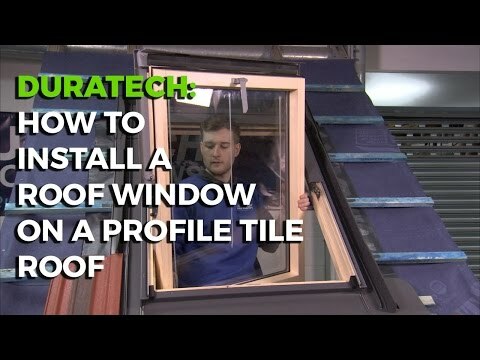 The window can be installed in a roof pitch from 15 to 90 degrees. Duratech roof windows are a fantastic way to let in plenty of natural light but what if you need to block out the light? Whether you are watching a movie or trying to get some much needed sleep at night, our blinds will ensure that you have complete control over the light levels in your room. These are designed to integrate neatly into the frame of your windows and boast many great features.